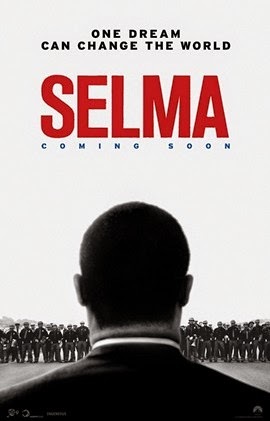 On Friday night I saw Selma, Ava DuVernay's film that depicts the 1965 Selma-to-Montgomery marches which led to the passage of the Voting Rights Act. I cried off all my mascara less than ten minutes into the film. As I left the theater I knew there was no way I would be able to write a blog post about that movie. There simply are no words to express how powerful it is, no way to describe the impact it had on me. Fortunately, others have been able to find the words that escape me. My husband, who is a columnist for The Birmingham News, wrote a compelling piece on why the movie is especially important at such a time as this -- in the wake of Black Live Matters protests and other modern-day civil rights issues. Birmingham-based blogger Alexis Barton wrote a great review detailing the many reasons you should go see this movie RIGHT NOW, including the fact that DuVernay highlighted the contributions that women made to the movement. And in his piece for WBHM 90.3 FM, Birmingham's NPR station, Andrew Yeager captured the reactions of Selma residents who saw the movie, some of whom were actually involved in the marches and have the scars to prove it. I am disappointed that some people are attempting to discount the movie due to "historical inaccuracies" such as President Lyndon B. Johnson's portrayal and the exaggerated tensions between President Johnson and King. First, as my husband states in his article, the movie is a drama not a documentary. Second, as Barton writes, "I don’t hear these arguments around films or television shows like Gone with the Wind or Mad Men, pieces of pure fiction which also play fast and loose with historical characterizations." And finally, such complaints completely draw attention away from the true message and purpose of the movie. This is not President Johnson's story! This is the story of the men and women who put their lives on the line for a right that many of us today take for granted. This is a story about the courage and dignity of a people determined to no longer be treated as second-class citizens. And this is a story that everyone should see.